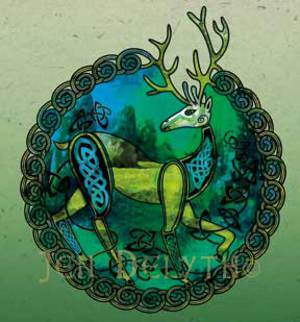 Celtic imagery is complex; its patterning communicates on both material and spiritual levels. 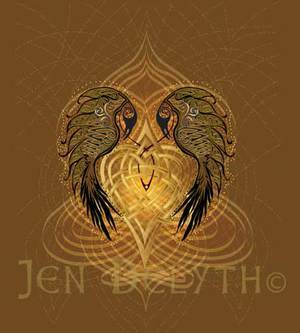 The fluid rhythms, twists and turns of labyrinth pathways resonate with the patterns of life. The interlacing ribbons create infinite loops without beginning or end. Spiral forms are a mystical sign of the universe seen everywhere in nature, in tree ring growth, snail shells, the patterns of wind and water. Animal symbols include the Boar, who is the popular insignia of the warrior. We find this creature of valor upon the shields and helmets , the drinking flagons and great cauldrons of the feast. The cornucopia of the Celts – rather than the classical symbol of a bowl overflowing with fruit – is a magnificent golden flagon, cast in the shape of a fierce boar with three horns, and filled with honeyed mead. It is offered to the Gods as a gift of the feast, for the blessing of bounty and fertility of the tribe. Birds such as the Raven – totem of the warrior goddess the Triple Morrigan – Cranes and the strangely popular Swans, which are intriguingly depicted wearing mystical silver or gold chains, each have their particular mystic symbolism that we encounter in mythology. Their beaked heads peer out among the abstract patternings and swirls of the Celtic metal-workings. The horned animals include the Stag and figures such as Cernunnos. The ancient Horned God represents the primeval powers of fertility and hunting, and continues to be an important figure for the Celts in the metal ages, as he was for the earliest Paleolithic shaman painters. Interesting combinations of horned birds and significant triple-horned bulls appear on Celtic coins and metal-works. Magical symbols, they combine the power of fertility associated with the Stag deity with the mysticism of the sacred triplicity, along with their virtues of spirit-bird flight or solar-bull strength.